In September 2017, Excelsior Editions published the latest book of Brooke Kroeger, an author and professor at the New York University Arthur L. Carter Journalism Institute. 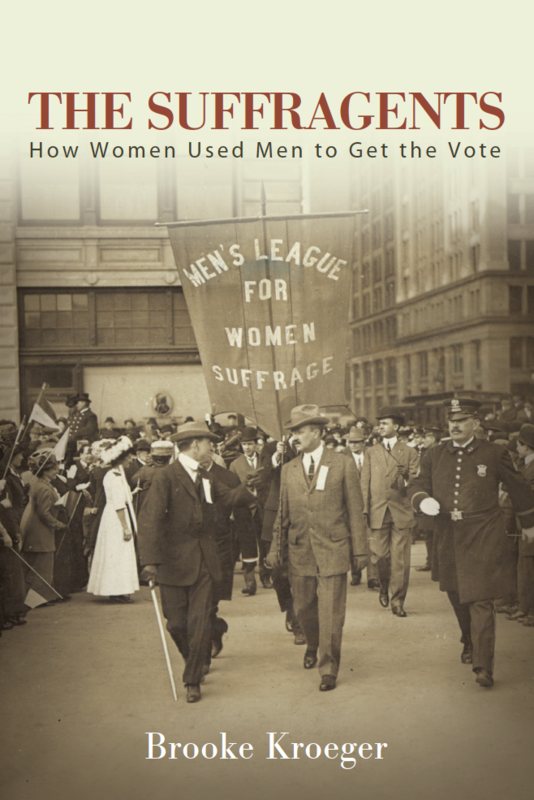 The Suffragents: How Women Used Men to Get the Vote tells the largely unknown story of the Men’s League for Woman’s Suffrage, a group of powerful men who banded together to lobby for women’s voting rights. Alex Kane, a researcher for this site and a former graduate in student of Kroeger’s at New York University, sat down with his professor and program director to talk about her book, its relevance for today’s political moment, and why the men’s league is not more well-known today. Alex Kane: I want to start out with a simple question: Could you explain who the “suffragents” were? Brooke Kroeger: “Suffragents,” of course, is a made-up name. It was originally a moniker attributed to the men who supported women’s suffrage in Britain and it came across the puddle. These men were either directly connected to an organization started in November 1909 called the Men’s League for Woman’s Suffrage–w-o-m-a-n, the style of the day–of the State of New York, or they were closely affiliated with the ideas and the people who were involved. The mission was to help the women’s suffrage movement to get over the finish line in the last decade of what was a 70-year struggle. AK: Why is it important to understand men’s contribution to this social movement? BK: When realizing that the suffrage centennial was about to take place, I started thinking, “What hasn’t been done about suffrage that would be illuminating.” As I thought about it, it occurred to me that there couldn’t have been a way for the women to succeed at obtaining the vote without some help from men. Men were the voters, for the most part. Men were the legislators, almost exclusively. Knowing that, it seemed obvious that they would have had some sort of help. So I went looking, and ran into references to a Men’s League for Woman’s Suffrage in much of the secondary literature. Scholars certainly have talked about it, but usually in a paragraph, or maybe a page and a half. That’s all there was in the record, both in academic work and and in less academic work. That told me there was something to learn. So I set about trying to find as much about it as I possibly could. And because it hasn’t been written about very much, not a lot of the record had been dug out. I went to the archives, to the correspondence of those whose names were coming up and what I found was a relatively modest amount of material. There wasn’t as much as you would have thought. The League wasn’t mentioned in their obituaries. It didn’t really appear in their memoirs, save Max Eastman’s, one of the only ones that mentions the League very specifically.) Several do write about their involvement with the suffrage as an issue and almost everyone has at least a passage about the 1911 suffrage parade in New York. I dug a lot of material out through the contemporaneous record. If I found, for example, say, that Max Eastman gave a speech in Troy, New York, I dug out the local newspaper for the days before and the day after, and in doing that kind of work, I’d sometimes happen on an editorial that shed more light, or comments by local women suffragists involved in organizing whatever event took place. A lot of best material came that way. I like that kind of work, and find it exciting. So why does it matter? It matters because it’s an important under-told slice of the record–and I would say a slice because these women were at the campaign for seven decades and the victory was theirs. But the active, organized participation of men in that last determinative decade certainly eased the way. James Lees Laidlaw’s mission statement for the League explains its purpose so well: It was to encourage support from men who wouldn’t come forward publicly unless there were numbers, to encourage those “not even ready to give the subject consideration until they see that a large number of men are willing to be counted in favor it,” and its says that those who oppose women’s suffrage would simply “pass away with this generation if not sooner.” He adds that men came in on the question of moral support: Here are women besieging legislators for years. Legislators are responsive to voters, and voters only. What could be harder for a non-voter? And lastly, from a contemporary standpoint, once I learned about “allyship,” I understood that the Men’s League had created a perfect exemplar of how to give meaningful aid a cause not one’s own. You can see that in the fact that they didn’t talk about it or take credit for anything, after it was over, after the work was done. They did what was asked, they helped where they could in very significant ways, including money, and they never took any credit. AK: You said that scholars had only devoted about a paragraph or so to the men’s league. Why do you think this history isn’t common knowledge? BK: I can only conjecture. But I think that in the periods where women’s suffrage history was getting written, in the 1960s and ’70s, as the reclamation of the record was underway, it was really important to give women primacy. The biographies, the history that was written–everything was focused on who the women were and what the women did. And the women were at it for such a long time, there was quite a lot to say. Remember, the men’s organized involvement was only for about a decade. When the proposal for the book was first circulating, I got some telling responses, such as “Who cares what the men think?” “I’d be glad to work with Brooke but not about this.” That was four or five years ago now, and I can sense a bit of a shift in that kind of thinking. But I’m guessing that’s part of why the story was submerged. Also, it was hard to dig out. AK: These were elite men, men from the clergy and the professional and upper classes. And your book has a ton of examples of newspaper headlines that shed a pretty favorable light on them. Did that surprise you? BK: No, I think that was part of the strategy. They played that celebrity role by enticing larger groups of people who admired their positions in society to think, “Oh, this is a club I could join. This is something I could or would like to be part of.” That was really important to the suffrage movement, whereas earlier, the suffragists were viewed as brown-shoed, dowdy dressed battle axes. Both the men of the League and the women of New York society who came into the movement at the same time changed the palette. AK: In the early stages of the suffrage fight, New York was a particular focus. Could you explain why it was so important to get New Yorkers on board the suffrage train? BK: True, a lot was centered in New York. Many of the great promotional ideas, were, as I like to say, New York-born and New York-borne. It just happened that it was an epicenter of suffrage activity, with Susan B. Anthony and Elizabeth Cady Stanton residents of the state. And remember, the years from 1898 to 1919 were the period where New York consolidated and conglomerated—its when the five boroughs came together—when the city fathers reimagined and refashioned in into a great metropolis. It was the place to be and the suffrage movement was one of the many forces involved in making it great. Also, up until the New York victory in 1917, there had been no states east of the Missouri that had accepted suffrage. So that was huge. In 1915, in fact, a Washington Post editorial writer had said that a defeat in New York would set the movement back ten years. Also, the official suffrage history notes that no state suffrage campaign was as dramatic or effective as New York’s. AK: You devote some ink to WEB Du Bois in your book, but he was not a member of the Men’s League. Why did you think he was important enough to warrant mention in the book when he wasn’t part of the league? BK: Because he was such an important figure of the period and because I thought it was important to have the book say what was happening in the African-American community, which wasn’t enthusiastic about suffrage because it was perceived as a white, middle-class movement with a too-strong scent of racism. Du Bois was also involved with Oswald Garrison Villard, a founder of the the Men’s League and, with Du Bois and so many others, a founding member of the NAACP. There was no real love lost between them, but there was a connection and common interests. AK: Obviously all the men profiled in your book supported women’s suffrage, but they weren’t on the same page ideologically. BK: That’s correct–isn’t that exciting? They were all progressives. They all understood a just cause. But they were Democrats, Republicans, socialists, independents. When do we see something like that happening? Where are these joint forces today, connected by a just cause? That powerful people of such political differences could come together in this way, I found very moving. AK: You talked about how your book was relevant to questions of “allyship” today. Is that the main relevance you think the book has? BK: I’d like to think so. In my mind’s eye, the book has a kind of primer quality for how to behave as one involved in the cause of another. I was struck by the way the men never spoke again about what they had done, and never took credit. There’s that wonderful line of James Lees Laidlaw, when he’s thanked after the vote in New York was won, and he says: “We men too have learned something, we who were auxiliaries to the great women’s suffrage party. We have learned to be auxiliaries.” This man is the head of a major financial company, on the board of directors of what became Standard and Poor’s, can trace his lineage back through 50 different lines to colonial days, and he’s talking about learning to be an auxiliary. There’s such a marvelous humility about what they did. In the book there’s a photo of a one-dollar receipt for a membership fee, and it’s signed by Ward Melville, the philanthropist and patron saint of Stonybrook, Long Island and creator of Thom McAnn Shoes. And he’s signing these little bitty receipts himself! They did their own scut work. Gentlemen of the 1910s. I love that. Other women will understand how gratifying that is to learn. When I first started, I thought I was going to find these men to be no more than the equivalent of celebrity endorsers, men who lent their names, signed some letters, and showed up to see the governor or a legislator from time to time. And I was bowled over by what I amassed.